"Like a big piece of candy"
The TR-800 is without a doubt one of the representative coat-pocket radios of the fifties and a favorite of many collectors. 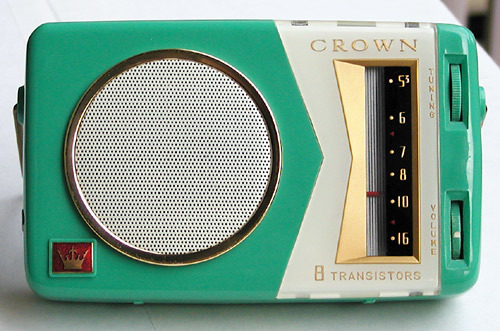 It also happens to be the earliest Crown transistor radio I can think of that places so much emphasis on flashy design, an observation consistent with the fact that I'm pretty sure it was made specifically for export and with the American market in mind. I have not yet found any evidence to suggest the TR-800 was sold in Japan and as such data is limited. However, the unit in these pictures appears to have been built in the second half of 1958. Shown here is my favored turquoise color, but the model was also available in light blue. The round speaker grille is painted white and surrounded by a brass ring. The corners and edges of the cabinet are all rounded. The tuning dial and surrounding area features angular lines and is reverse painted in white, gold, black and red. The face is decorated with a rectangular red and gold cloisonne crown logo. Somehow these elements all manage to collide yet cohabit in a design that works wonderfully as a whole. A tribute to the nuclear era?